01. 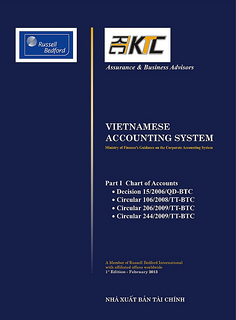 This standard aims to prescribe and guide the accounting principles and methods applicable to tangible fixed assets, including criteria of tangible fixed assets, the time of recognition and determination of initial value, costs incurred after initial recognition, determination of value after initial recognition, depreciation, liquidation of tangible fixed assets and some other regulations serving as basis for recording accounting books and making financial statements. 02. This standard applies to the accounting of tangible fixed assets, except where other accounting standards permit the application of other accounting principles and methods to tangible fixed assets. 03. Where other accounting standards prescribe methods of determining and recognizing the initial value of tangible fixed assets other than the methods defined in this standard, other contents of tangible fixed asset accounting shall still comply with the regulations of this standard. 04. Enterprises must apply this standard even when they are affected by price changes, except otherwise prescribed by State decisions related to the re-appraisal of tangible fixed assets. Tangible fixed assets means assets in physical forms which are possessed by the enterprises for use in production and business activities in conformity with the recognition criteria of tangible fixed assets. Historical cost means all the costs incurred by the enterprises to acquire tangible fixed assets as of the time of putting such assets into the ready-for-use state. Depreciation means the systematic allocation of the depreciable value of tangible fixed assets throughout the useful life of such assets. Depreciable value means the historical cost of tangible fixed assets recorded on financial statements, minus (-) the estimated liquidation value of such assets. b/ The volume of products, or similar calculating units which the enterprise expects to obtain from the use of assets. Liquidation value means the value estimated to be obtained at the end of the useful life of the assets, after subtracting the estimated liquidation cost. Reasonable value means the value of assets, which may be exchanged among knowledgeable parties in the par value exchange. Residual value means the historical cost of tangible fixed assets after subtracting the accumulated depreciation thereof. Recoverable value means the value estimated to be obtained in future from the use of the assets, including their liquidation value. d/ They meet all value criteria according to current regulations. e/ Perennial tree garden, animals reared to labor for humans and to yield products. f/ Other tangible fixed assets. 08. Tangible fixed assets often constitute a key component in the total assets and play an important role in the reflection of the financial situation of enterprises. Therefore, the determination of an asset whether or not to be recognized as tangible fixed asset or a production or business expense in the period shall greatly affect the reporting of the enterprises' operation and business results. 09. When determining the first criterion (prescribed in Section a, paragraph 06) of each tangible fixed asset, the enterprises must determine the degree of certainty of the acquisition of future economic benefits, on the basis of evidences available at the time of initial recognition, and must bear all related risks. Though being unable to directly yield economic benefits like other tangible fixed assets, those assets used for the purposes of ensuring production and business safety or protecting the environment are necessary for enterprises to achieve more economic benefits from other assets. However, only if their historical cost and that of related assets do not exceed the total value recoverable from them and other related assets shall these assets be recognized as tangible fixed assets. For example, a chemical plant may have to install equipment and carry out new chemical-storing and-preserving processes in order to comply with the environmental protection requirements in the production and storage of toxic chemicals. Any related installed accompanying fixed assets shall only be accounted as tangible fixed assets if without them the enterprises would not be able to operate and sell their chemical products. 10. The second criterion (prescribed in Section b, paragraph 06) for recognizing tangible fixed assets is often satisfied since the historical cost of the fixed assets has been already determined through procurement, exchange, or self-construction. 11. When determining components of tangible fixed assets, the enterprises must apply the criteria of tangible fixed asset on a case-by-case basis. The enterprises may consolidate secondary, separate parts, such as molds, tools, swages, and apply the criteria of tangible fixed asset to such aggregate value. Accessories and auxiliary equipment are often seen as movables and thereby accounted into use costs. Major accessories and maintenance equipment shall be determined as tangible fixed assets when the enterprises estimate that their useful life would last for over one year. If they are only used in association with tangible fixed assets irregularly, they shall be accounted as separate tangible fixed assets and depreciated over a period shorter than the useful life of related tangible fixed assets. 12. In each specific case, the total cost of assets may be allocated to their components and separately accounted for each component. This case shall apply when each component of an asset has a different useful life, or contributes to creating for the enterprise economic benefits which are assessed according to different prescribed criteria so it may use different depreciation rates and methods. For example, an aircraft body and engine should be accounted as two separate tangible fixed assets with different depreciation rates if they have different useful lives. 14. The historical cost of a procured tangible fixed asset consists of the buying price (minus (-) trade discounts and price reductions), taxes (excluding reimbursed tax amounts) and expenses directly related to the putting of the assets into the ready-for-use state, such as ground preparation expense; initial transportation, loading and unloading expense; installation and trial operation expense (minus (-) amounts recovered from products and wastes turned out from trial operation); expert cost and other directly-related expenses. For tangible fixed assets formed from construction investment by contractual mode, their historical costs are the settled costs of the invested construction projects, other directly-related expenses and registration fee (if any). 15. Where procured tangible fixed assets are houses, architectural objects associated with the land use right, the land use right value must be separately determined and recognized as intangible fixed asset. 17. Incurred costs, such as administrative management cost, general production costs, trial operation cost and other costs…, if not directly related to the procurement and the putting of fixed assets into the ready-for-use state, shall not be included into the historical cost of tangible fixed assets. Initial losses caused by the machinery's failure to operate as planned shall be accounted into production and business expenses in the period. 18. The historical cost of a self-constructed or self-made tangible fixed asset is its actual cost plus (+) the installation and trial operation cost. Where the enterprises turn the products made by themselves into fixed assets, the historical costs shall be the production costs of such products plus (+) the expenses directly related to the putting of the fixed assets into the ready-for-use state. In these cases, all internal profits must not be included in the historical cost of these assets. Unreasonable expenses, such as wasted materials and supplies, labor or other costs in excess of the normal levels arising in the self-construction or self-generating process must not be included in the historical cost of tangible fixed assets. 20. The historical cost of a tangible fixed asset purchased in the form of exchange for a dissimilar tangible fixed asset or other assets shall be determined according to the reasonable value of the received tangible fixed assets, or that of the exchanged ones, after adjusting the cash amounts or cash equivalents which are additionally paid or received. 21. The historical cost of a tangible fixed asset purchased in the form of exchange for similar one, or possibly formed through its sale in exchange for the right to own similar ones (similar assets are those with similar utilities, in the same business field and of equivalent value). In both cases no profit or loss is recognized in the exchange process. The historical cost of the received fixed asset shall be the residual value of the exchanged one. For example, the exchange of tangible fixed assets is similar to exchange of machinery, equipment, means of transport, service establishments or other tangible fixed assets. 22. The historical cost of a tangible fixed asset which is donated or presented shall be initially recognized according to the initial reasonable value. Where it is not recognized according to the initial reasonable value, the enterprises may recognize it according to the nominal value plus (+) the expenses directly related to the putting of the assets into the ready-for-use state. 23. The costs incurred after the initial recognition of tangible fixed assets shall be recorded as increase in their historical cost if these costs are certain to augment future economic benefits obtained from the use of these assets. Those incurred costs which fail to meet this requirement must be recognized as production and business expenses in the period. c/ Applying new technological production processes, thereby reducing the operational costs of the assets. 25. The repair and maintenance costs of tangible fixed assets for the purpose of restoring or sustaining their capability to bring about economic benefits as in their original operating conditions shall be included into production and business expenses in the period. 26. The accounting of the costs incurred after the initial recognition of tangible fixed assets must be based on each particular case and the recoverability of these costs. When the residual value of the tangible fixed assets has already been composed of reductions in economic benefits, those costs incurred afterwards to restore economic benefits from these fixed assets shall be included in the historical cost of the fixed assets if their residual value does not exceed their recoverable value. Where the buying price of a tangible fixed asset has already covered the enterprises' obligation to incur those costs for putting the assets into the ready-for-use state, the capitalization of the costs incurred afterwards must be also based on the recoverability of these costs. For example, an enterprise buys a house which needs some repair before it can be used. The house repair cost shall be included in the historical cost of the asset if such cost is recoverable from the future use of the house. 27. Where some parts of tangible fixed assets need to be replaced on a regular basis, they shall be accounted as independent fixed assets if they satisfy all the four (4) criteria of a tangible fixed asset. For example, air-conditioners in a house may be replaced many times throughout the useful life of the house. The costs incurred in the replacement or restoration of these air-conditioners shall be accounted as an independent asset and the value of the replaced air-conditioners shall be recorded as a decrease. 29. The depreciable value of tangible fixed assets shall be allocated systematically during their useful life. The depreciation method must be suited to the economic benefits yielded by the assets to the enterprises. The depreciated amount of each period shall be accounted into the production and business expenses in the period, unless they are included in the value of other assets, such as depreciation of tangible fixed assets used for activities in the development stage is a cost component of the historical cost of intangible fixed assets (according to the regulations of the standard intangible fixed assets), or the depreciation cost of tangible fixed assets used in the process of self-constructing or self-making other assets. d/ Legal constraints in the asset use, such as the date of expiry of the contract of financial-leasing fixed assets. 31. The useful life of tangible fixed assets shall be determined by the enterprises mainly on the expected use extent of the assets. However, due to the asset management policy of the enterprises, the estimated useful life of fixed assets may be shorter than their actual useful life. Therefore, the estimation of the useful life of a tangible fixed asset must be also based on the enterprise's experiences on assets of the same type. By the straight-line depreciation method, the annual depreciation amount is kept unchanged throughout the useful life of assets. By the declining-balance depreciation method, the annual depreciation amount gradually declines throughout the useful life of assets. The units-of-output depreciation method is based on the estimated total quantity of product units the assets may turn out. The depreciation method applied by the enterprises to each tangible fixed asset must be implemented consistently, except where appear changes in the mode of its use. The enterprises must not continue depreciating tangible fixed assets which have been entirely depreciated but still used for production and business operations. 33. The useful life of tangible fixed assets must be reconsidered periodically, usually at the end of the fiscal year. If there is any considerable change in the estimation of the useful life of assets, the depreciation rate must be adjusted. 34. In the process of using fixed assets, once it has been determined with certainty that the useful life is no longer suitable, it must be adjusted together with the depreciation rate for the current year and subsequent years, which shall be expounded in the financial statements. For example: The useful life may be extended as a result of the improvement of the asset's conditions as compared with their initial standard conditions; technical modifications or changes in the demands for products produced by a machine may also shorten the useful life of the assets. 35. The tangible fixed asset repair and maintenance regime may help prolong the actual useful life or increase the estimated liquidation value of assets but the enterprises must not change the depreciation rate of these assets. 36. The method of depreciation of tangible fixed assets must be reconsidered periodically, usually at the end of the fiscal year; if there is any change in the way of using the assets, which brings about benefits for the enterprises, the depreciation method and rate may be changed for the current year and subsequent years. 37. Tangible fixed assets which are liquidated or sold shall be recorded as a decrease. 38. Profits or losses arising from liquidation or sale of tangible fixed assets shall be determined as differences between incomes and liquidation or sale costs plus (+) the residual value of the tangible fixed assets. These profits or losses shall be recognized as an income or an expense on the reports on the business results in the period. Other changes in tangible fixed assets. 40. The determination of the depreciation method and the estimation of the useful life of tangible fixed assets bear a purely presumptive nature. Therefore, the presentation of the applied depreciation methods and the estimated useful life of tangible fixed assets permits the users of financial statements to examine the correctness of the policies set out by the enterprise management and have basis for comparison with other enterprises. 41. The enterprises must present the nature and impact of the changes in accounting estimation which bear a crucial influence in the current accounting period or subsequent periods. The information must be presented when there arise changes in the accounting estimates related to the already liquidated or to be-liquidated tangible fixed assets, their useful life and depreciation methods.